Heat a grill to high and oil the grates. Sprinkle the salmon with salt and pepper; set aside. In a small saucepan, combine the rice vinegar, ginger, honey and olive oil and bring to a simmer over high heat. Stir in the grapes and scallions, and season with salt and pepper. Set aside off the heat. Grill the salmon skin side up for 5-6 minutes. Turn and grill another 2-3 minutes or until salmon reaches desired doneness. 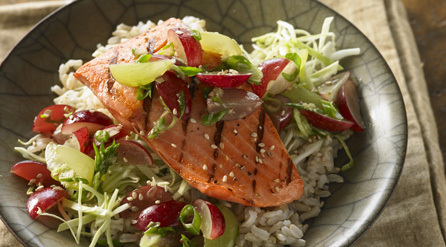 Divide the rice among four bowls and top with the cabbage and salmon. Spoon the grape mixture over top and sprinkle with sesame seeds. Serve with soy sauce, if desired. Our site is part of Gourmet Ads (www.gourmetads.com). If you are interested in running an advertising campaign with us, please contact the sales team at Gourmet Ads.